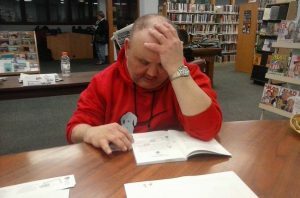 This past February, two branches began hosting a new kind of book club where anyone can join, regardless of reading ability. 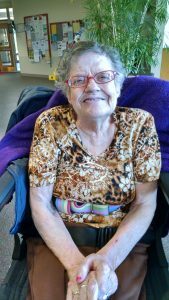 Described as community-based literacy programs for people with developmental disABILITIES and everyone else, Next Chapter Book Clubs (NCBC) invite members to keep reading and to make friends in a supportive atmosphere. Club meetings occur in a public space, both to visibly promote taking part in an activity that others of various abilities also do, and to encourage interactions with passers-by, who often stop to say hello or to ask how they might get involved. Clubs are led by trained facilitators and now take place in over 100 cities. Ohio alone has several chapters, with Athens as one of two main facilitator training sites. Photo courtesy of The Sech-Kar Studio Group. The NCBC that meets at our Nelsonville branch recently finished their first book Adalyn’s Clare about a girl and her therapy dog. To celebrate, members received certificates of completion and held a party with two special guests: a Nelsonville resident and his own therapy Border Collie. 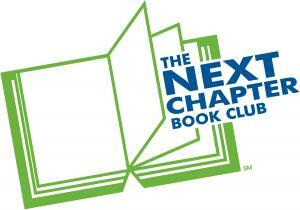 Next Chapter Book Clubs currently meet at the Athens Public Library every Tuesday from 10:30–11:30am and at the Nelsonville Public Library every Tuesday from 1:00-2:00pm. All are welcome!